Following the attacks on Gouyave, St John and Grenville, St Andrew on the night of 3 March 1795, Grenada was plunged into bloody conflict as its French inhabitants, whites and especially free coloureds, led their slaves in revolt against the British. The rebels, led by Julien Fedon, carried out their threat and executed over 40 British hostages, including Lieutenant Governor Ninian Home, when their camps were attacked by British forces on 8 April 1795. In the following months the war dragged on, and by early 1796 the rebels controlled most of the island. They were, however, unable to capture the strategic Town of St George and its immediate surroundings, which the British had maintained control over. By March 1796 the British, with reinforcements, captured the strategic positions of Post Royal and Pilot Hill in the east, cutting off the rebels’ primary external supplies of weapons and food. British forces continued to stage successful victories, and on 10 June Captain Jossey, representing French forces in Grenada, signed articles of capitulation, thus ending the rebels’ control of Gouyave and areas on the west coast. 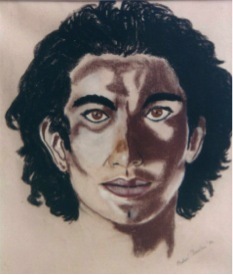 The British had categorically rejected the surrender of the Grenada free coloureds, including Julien Fedon. Thus, the remaining rebels fled to their mountain stronghold at Fédon’s Camp and awaited the final assault, which took place on 19 June and ended in the defeat of the rebels. Though open hostilities ended on 19 June, it took weeks for the British to capture the remaining rebels who remained in the woods. It took the British 16 regular military units, inclusive of hired troops, 15 months, and the loss of hundreds of soldiers from yellow fever and hostilities before the rebellion of its new subjects and their slaves was quelled. Over 50 rebels were captured, tried and found guilty of high treason, and 35 “noted brigands” were publicly executed “on a large gibbet in the Market place in St George’s” on three occasions in July 1796. In a final act of vengeance the heads of the rebels were reportedly severed from their bodies and publicly displayed. Rebels not jailed or executed, together with their families, were subsequently deported. The rebellion of the French and their slaves (Fedon’s Rebellion) against the British remains second only to that the successful Haitian Revolution! 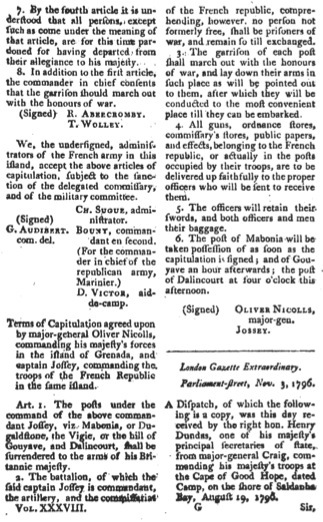 Terms of the capitulation between Captain Jossey and Major-General Oliver Nicolls on 10 June 1796 at Gouyave, St John.